Most skin diseases occur in people of all nationalities, regardless of their skin color. Particular problems encountered in the skin are more common in people with different hues of skin, and sometimes a disorder seems more prominent because it affects skin color. This column completes our consideration of these problems and their treatment in this series. This condition is also known as “razor bumps.” Hair is made of a protein called keratin, and it can be extremely inflammatory to the skin. It is called “pseudo” folliculitis because the hair can actually come out of the follicular opening and penetrate nearby skin, causing it to look like inflammation, or folliculitis, of that pore. However, because it is just nearby the actual follicle, it is “pseudo” folliculitis. This is most often seen in persons with curly hair or hair that grows at an oblique angle to the skin. Sometimes, if curly hair is cut extremely close, it never even exits the skin surface, instead penetrating the sidewall of the follicle (known as transfollicular penetration), or it comes out of the follicle and pokes the skin (known as extrafollicular penetration). The results are the same: The keratin invades the skin, producing a brisk inflammatory reaction that causes itching and the formation of pustules. When pseudofolliculitis is mild to moderate, many topical treatments can be implemented, including a very gentle oatmeal-based shaving cream, and a non-electric razor with a safety guard, so the hairs are not cut too short. Shaving after a shower is also recommended when the hair is hydrated, so the final tip is soft as opposed to sharp. Also, using a soft-bristle toothbrush to make circular motions in the beard area before bedtime can prevent the hair from penetrating as it grows throughout the night. Topical anti-inflammatory aftershave lotions and oral anti-inflammatories can also be used if necessary. In the majority of cases, this can provide satisfactory relief. However, in certain instances in which relief is not achieved through these means, the best treatment is to remove the offending agent. In this case, I recommend laser hair removal. 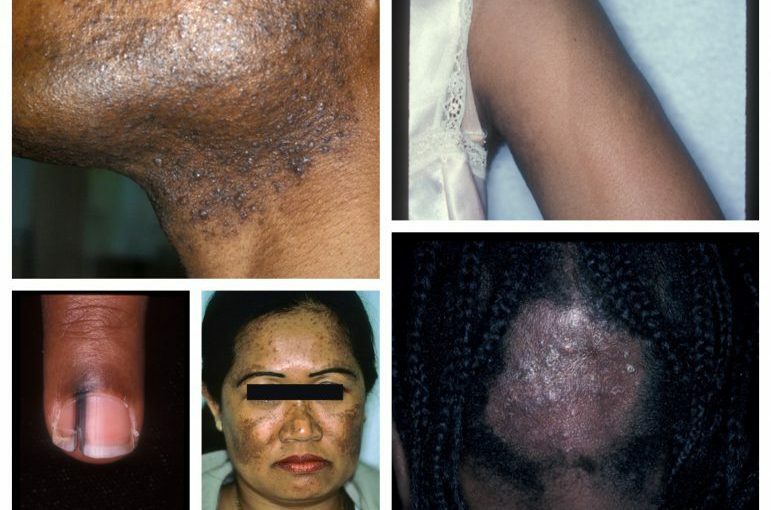 Tinea capitis, also known as ringworm, is endemic in African American children. Any child with a scaling, itching scalp should be thoroughly investigated for tinea capitis. One of the clues to this is enlarged lymph nodes in the nape of the neck. I recommend a topical anti-itch anti-inflammatory lotion in addition to an oral antifungal agent. No matter what agent is used, it is essential that treatment occurs for at least eight weeks at a somewhat high dose, as advised by a board-certified dermatologist. It is also recommended that all objects that touch the hair, such as combs, barrettes, rubber bands and pillowcases, be replaced or treated to prevent re-infection. I also advise all members of the household to use an anti-fungal shampoo throughout the treatment period for two months. This is a prevalent yet easily treatable condition in young children. I believe that as people get older, the milieu of their scalp sebum changes, preventing an active infection. However, many adults can be carriers and pass it to their children, who are prone to the infection. This is a condition where brown to black longitudinal bands occur in many, if not all, the fingernails and toenails. This is a common, benign condition that is often seen in multiple family members. However, if one band should occur spontaneously without a family history, this should be evaluated for an underlying mole or melanocytic malignancy. These are lines seen most commonly on the upper arms and sometimes thighs and are normal variations. They were named after a physician and anatomist who first described these near the turn of the century. They are harmless. Melasma is a common and vexing problem that I see on a regular basis in our clinic. It presents as hyperpigmented patches occurring on the cheeks, upper lip, forehead, and sometimes dorsal forearms. It can be extremely challenging to treat, and I inform patients that 25 percent of the time there’s not much we can do about it. I also tell patients that it is a lifelong battle and something that we’ll always have to treat and use preventive measures to keep from coming back. It’s usually a result of hormones, genetics, and sun exposure. Commonly the hormones can include the initiation of oral contraceptives and/or pregnancy and childbirth. I often tell patients that it’s a very rapid, uneven suntan occurring in the areas described. It’s exacerbated by sun exposure and, we discovered recently, heat exposure. So, people who enjoy saunas, hot showers, steam baths, and warm climates should know these can exacerbate the condition. So, patients with melisma must consider meticulous sun protection and heat avoidance. I tell patients that they need to apply sun protection before they leave the house. Any amount of sunlight that touches their skin while walking from a car across a parking lot into a building, even on a cloudy day, is enough to trigger its occurrence. Treatments include topical lightening agents, deep skin peels, and newer laser treatments. In three-quarters of patients, we certainly can see satisfactory results, although it’s one of the most challenging conditions that I treat. I see it almost on a daily basis in my practice.